Chattanooga has no shortage of things to do for the family. This itinerary covers a weekend, but you could easily spend more days exploring downtown and nearby recreation areas. Because of its proximity to our home town, we’ve spent many weekends in this fun and entertaining city. It has good local food and breweries, historic civil war sites, a wonderful children’s museum and aquarium, one of the largest climbing walls in the southeast, and a lovely downtown pedestrian bridge crossing the Tennessee River. Also, check out our blog post "A Family Weekend in Chattanooga." Day 3- Your choice of climbing walls, a children's museum, and/or a walk/bike along the river. Or all 3! For this itinerary, staying downtown is the way to go. Unfortunately, there aren’t many airbnb or VRBO listings for this area. We have always stayed in hotels directly downtown and walkable to everything (restaurants, museum, aquarium, the river, etc.) Tip: It is worth the extra money to be downtown and not have to find parking each day. Here are some of our favorites. My first choice is the Holiday Inn, but it generally comes down to which hotel has the best rate. They are all excellent choices and wonderful locations along Chestnut Street. Tip: Check with your hotel to see if they offer a Lodging/Aquarium Package. Heads up: We are not sponsored in any way and have never received compensation at the behest of any organization or company. If you book one of our recommended properties from our VRBO or booking.com links, you won’t pay a penny more but we may get a small commission which helps support this website. Thanks! Disclosure Statement. Holiday Inn and Downtown Suites- Located at 434 Chestnut Street. A relatively new hotel. It has an indoor pool and an adjacent outdoor rooftop patio with a fire pit. Kids eat free. Note that valet parking is required here for $15/day. There is no self-parking option. This hotel is usually the best price point around $140 per nite. I have stayed here two times and have always had a good experience. Courtyard by Marriott Downtown- Also located on Chestnut Street (200 block), this is your typical Courtyard conveniently located within walking distance of everything downtown. Indoor pool. Hilton Garden Inn- Downtown- Another good option with an excellent location and indoor pool. 311 Chestnut St.
Hampton Inn Downtown-It offers a free hot breakfast, but I would hate to miss out on the local Blue Plate restaurant and Maple Biscuit Co. Again, an excellent location walkable to all of downtown. It has an outdoor pool. 400 Chestnut St. Double Tree by Hilton Downtown- Good location with an outdoor pool. 407 Chestnut St.
Springhill Suites is riverfront and a 15 minute walk to the aquarium. Studio, 1 and 2 bedroom suites with sleeper sofa. Some rooms have balconies overlooking the Tennessee River. Nice outdoor terrace area with fire pit and an indoor pool. Mini fridge and microwave. Expect to pay closer to $200. 495 Riverfront Parkway. Tip- Chattanooga offers a free electric shuttle that covers all of downtown. Running daily about every 5 minutes from the Chattanooga Choo Choo to the Tennessee Aquarium with stops every block in between. Click here for a shuttle map. If it works out for you in terms of time, stop at two of Chattanooga’s famous tourist spots: Rock City and the Incline Railway on your way in to town. They are located just 6 miles outside of downtown and within an 8 minute drive of each other. By visiting these attractions on the way to your downtown lodging, you can then leave your car behind for the rest of the trip after checking in to your hotel. All other attractions and restaurants will be within walking distance of your hotel. Today, you’ll “See Rock City.” I wasn’t sure what to expect here and am delighted to report that it’s a really fun and pleasant outdoor destination. It was a favorite event for our kids, and it only took an hour to walk the trail. The views are fantastic, and on a clear day they claim you can view 7 states from the lookout point (but I have my doubts about Kentucky). As you continue on the trail, you’ll get to squeeze between boulders at “Fat Man’s Squeeze”, cross a suspension bridge, and view waterfalls. It’s a bit kitschy with hidden gnomes throughout your walk and a fairy tale garden at the end (which is dark and lit by blacklight but was actually pretty fun). Overall, Rock City got the “thumbs up” from both kids and adults. 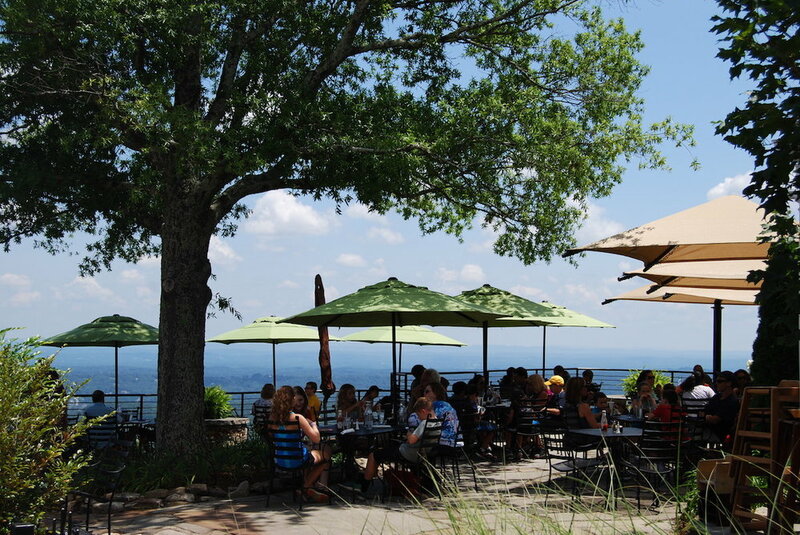 Tip: It has a a reasonably priced nice outdoor cafe near Lookout Point if you need a refreshment. See our blog post "See Rock City! Sure, What Is It? for more info about this surprisingly fun activity. Tip: You can purchase a bundled ticket to both Rock City and the Incline Railway. We purchased the Triple Play Pass that included Rock City, Incline Railway, and Ruby Falls (a guided tour to an underground waterfall in a cavern). Ruby Falls, however, was our least favorite due to the 2+ hour time commitment, most of which was standing and waiting for other tour groups to pass. It would, however, be an excellent rainy day excursion or save it for the winter when it is less busy. A trolley-style railroad car will slowly take you up and back down Lookout Mountain following a 72.7% grade. It takes about 20 minutes to load and go up the mountain and includes an interesting recorded narration of its history. This attraction was a big hit for the younger kids (under 10). Important note: It is HOT in the summer with little ventilation inside. If you go during the summer, consider going either early in the morning or around sunset. Open 8:30am-9:30pm daily during the summer. Check their website for current hours. Cost- Adult: $15 round trip; Child (ages 3-12): $7 round trip Parking info: There is an ample parking lot at the lower St. Elmo station. 3917 St. Elmo Avenue-$2.00 parking fee (pay at the kiosk). If you decide to skip the Incline Railway, do not skip Point Park which resides at the top of Lookout Mountain. The stroll takes you by spectacular homes perched on the side of the mountain. Inside the park, you’ll find wonderful views of the Tennessee River and Chattanooga complete with cannons and placards explaining its history. It also houses the small Ochs Museum which has great photos. (It’s located near the observation deck.) With its long pathways, Point Park is also a good place to get the wiggles out for the kiddos. Open Monday-Sunday 8:30am-9:30pm. Cost=$5. An entry fee is charged per person, ages 16 and older, ages 15 and under enter the park for free. Tickets are purchased at the fee station at the entrance to the park. Tip: Clumpies Ice Cream store is located just outside the entrance to Point Park. 1110 E. Brow Rd. 1110 E. Brow Rd. Open 11am-9pm. Note to hikers: You'll find some good hiking trails all around and up/down Lookout Mountain. From Point Park, you can hike 1 mile to Sunset Rock (relatively flat). Or, from Ochs Highway, you can hike a one mile roundtrip trail to Glenn Falls, a small waterfall where the kids can play. Beyond that, many of the trails involve lots of elevation gain so it may be too much for young kids. Click here for more info on these hikes. Check-in to your hotel and relax at the pool! Lupis Pizza. Located downtown, Lupis has been awarded Chattanooga’s best pizza over numerous years. It’s a fun atmosphere and they have a very good beer selection. Tip: If the kids are tired, order take out from here and enjoy at the hotel. 406A Broad St. Maple Street Biscuit. You get to pick the toppings for your biscuit which makes this a fun dining experience for everyone. They also have salads and entrees for lunch and dinner. I recommend the mac ‘n cheese! Opens at 7am but closed Sundays. 407 Broad St. The Tennessee Aquarium is definitely a worthwhile visit for the family. Located downtown near the banks of the Tennessee River, it is comprised of two separate buildings: River Journey (fresh water) and Ocean Journey (sea water). My girls especially enjoyed the sea horses, the jellyfish exhibit (my personal favorite), sharks, the butterfly room, the new lemur exhibit, the playful river otters, and the hands-on activities touching sturgeons and horse-shoe crabs. I would plan for at least 1 hour for each building. You can take a break between buildings or go to lunch and come back to resume your visit. Address: One Broad Street. Tip: Arrive early for less crowds. Also, evening is less crowded. Entry times are from 10am-6pm daily but you can enter at 6pm and stay until 7:30pm. We’ve often had the place to ourselves doing this. Aquarium Tickets-You can buy tickets on site: $29.95 for adults and $18.95 kids (3-12). You also have the option of upgrading to add the 45 minute IMAX movie for $37.95 adults and $26.95 kids (3-12). Tip: For $175, you can get the 2 adult and 5 kid family pass (can be any 5 kids but the adults are specific) which grants you unlimited visits for a year to the aquarium. The pass will also get you discounts on IMAX, Discovery Children’s Museum, High Point Climbing Wall, Big River Grill and other Chattanooga restaurants. Might be worth it depending on your family size and proximity to Chattanooga for return trips. Parking: There are several paid parking lots near the Aquarium and a free shuttle runs daily in downtown Chattanooga. It is walkable from all of the hotels listed in this itinerary. After visiting the aquarium, walk over the Tennessee River on the Walnut Street Bridge, one of the world's longest pedestrian bridges. This is a fun activity in itself! This will bring you to Chattanooga’s Northshore historic district, which offers several boutiques, art galleries, and restaurants. After crossing the bridge, turn right on Frazier Ave to have a fun time at the German restaurant Brew Haus. Share a pork schnitzel and an order of bavarian pretzels with mustard. It's yummy! They also have burgers and salads if you’re feeling less Deutsche. 224 Frazier Ave. The Brew Haus is a 15 minute walk (0.7 miles) from the Tennessee Aquarium. If you decide to skip the walk, consider eating at Mellow Mushroom Pizza adjacent to the Aquarium. Return to the aquarium to finish your tour and revisit your favorite spots. Big River Grill and Brewery. Located across from the Aquarium at 222 Broad St. A great stop for locally crafted beer and good food. They have a children’s menu as well. Also a good place to relax with snacks and a drink. Tip: The kid’s dessert menu features an Oreo ice cream pie for $1.99 (inexpensive and delicious!) Tip: If you sit outside, you can sometimes watch High Point’s climbers scale the outside of the building across the street. Remember: An Aquarium Family Pass gets you a 15% discount here. If the weather is nice, grab a table outside at Blue Plate Cafe and watch the Tennessee River flow by. The food was terrific and they serve breakfast all day along with a lunch and dinner menu. My girls devoured their Kids Breakfast Plate-- one pancake, two pieces of Applewood bacon, and a scrambled egg. I would recommend this restaurant for lunch and dinner too. From their website: “Contemporary comfort food, fresh drinks and house desserts using homegrown ingredients from local farms, bakeries and ice cream shops.” Tip: If there’s a wait for a table, the kids can blow off steam on the large grassy lawn in front. Address: 191 Chestnut St. Closed Mondays. Opens at 7:30am and 8am on weekends. Before hitting the road, walk along the River Trail or spend a couple of hours at the indoor climbing wall at High Point or the Creative Discovery Museum. Depending on your departure time, you could do all 3! Trust me that your kids will not want to leave the Kid Zone, designed especially for the young climber. Plan 2 hours here to get your money’s worth. A day pass costs $15 for adults and $14 for kids. $5 gear rental and a brief 5 minute orientation will get your started if it’s your first time. Next time we visit Chattanooga, we are going to buy our pass early in the day and hop in and out between our activities. It is located across the street from Big River Grill and Brewery at 219 Broad Street. Opening hours vary by the day (alternating between a 6am and 10am opening), so check their website. My girls have always loved visiting this 2 story hands-on museum where kids can splash in a manmade “river,” dig for dinosaur bones in the sand or make music with a Djembe or auto harp. On the upstairs outdoor patio, kids can hoist themselves up with simple pulleys and levers at the Rooftop Fun Factory. I think it’s best suited for kids 10 and younger. Plan for 2 hours. Cost: $13.95 for both adults and children over 2. Tip: Your Aquarium ticket stub will get you a $2 discount on each ticket or use your Aquarium Family Pass if you have one for a discount. Open daily 10-5. Hours change seasonally, so double check on their website. Address: 321 Chestnut St. (Corner of Chestnut and 4th). The Tennessee Riverpark is an 11.5 mile paved, scenic, flat, urban greenway that follows the Tennessee River. (You can see it from the patio at Blue Plate.) Although Chattanooga has an excellent bike share program, you have to be 16 years or older to use it. If you didn’t bring kid bikes, enjoy a nice stroll before heading home. From downtown, access the trail at Ross’s Landing behind the Aquarium. If you did bring bikes, you can ride 7.5 miles upriver to the Chickamauga Dam on fully paved greenway. The pathway has plenty of water fountains and restrooms along the way if needed. Click here for the Riverwalk Map. Day 3- A treat to bring home! Chattanooga is home to the southern delicacy, the Moon Pie (a perfect combo of graham cracker, chocolate, and marshmallow). You’ll find them in all flavors at the Moon Pie General Store located at 429 Broad St. Many of the activities in this itinerary can be done in any weather condition: The Tennessee Aquarium, the Creative Discovery Museum, and High Point Climbing Wall. In addition to these, you could visit Ruby Falls Cavern, the downtown IMAX movie, or the downtown Regal Movie theater. The Hunter Museum could also be a good excursion if needed. Rock City apparently hands out free ponchos on rainy days, but it would be better to go on a clear day for the views. Ruby Falls Cavern-1720 Scenic Highway. AMC Movie Theater-311 Broad Street. Hunter Museum of American Art- Children under 17 free. 10 Bluff View Ave.
Do the kiddos need to burn off steam? Have you visited the Aquarium too many times already this winter? This under the radar destination in Chattanooga is the perfect family destination for an indoor activity during cold or rainy weather. Next time you visit Chattanooga, you should check out High Point Climbing Wall. See Rock City! Sure, What Is It? You’ve probably seen the slogan “See Rock City” painted on the rooftops or sides of barns on highways throughout many parts of the U.S. It’s a long standing tourist slogan ever since the opening of Chattanooga’s Rock City Gardens in 1932. Because advertising in those days was difficult, they hired a sign painter to travel the nation’s highways and offer to paint a farmer’s barn in exchange for letting him paint three simple words: “See Rock City.” These distinctive black-and-white signs appeared as far north as Michigan and as far west as Texas. You might also be interested in these itineraries. If you’ve traveled on I-81 between Tennessee and Virginia, you’ve likely seen the turnoff for Johnson City. It’s another small city in the foothills of the Appalachian Mountains, and their logo aptly states “start your adventure here.” It’s a great hub for biking, hiking, and even exploring a fossil site. A revitalized downtown offers terrific restaurants and breweries in a quaint setting. It’s a place where you can spend a day hiking the Appalachian Trail over numerous mountain balds with amazing 360 degree views, bike a local family-friendly bike path, or tour a fossil dig site. And from all of these activities, easily return to town for lodging, a local craft beer, and a great meal. Knoxville has changed quite a bit in the last decade and all in good ways. The thriving downtown has become a huge destination for outdoor enthusiasts with the addition of the Urban Wilderness and its opportunities to explore world class mountain biking trails, try your hand at paddle boarding, or go for a short hike with the family. All only 4 miles from downtown Knoxville. And downtown is booming--new restaurants, local shops, craft breweries, and art galleries are opening every day. There are plenty of activities for any family to enjoy a weekend getaway in this city, whether you are an adventure sports enthusiast or just like to explore fun cities and eat lots of good food. If you have an awesome photo and send it to us, #simplyawesometrips, we will post it to our instagram page. We love seeing your vacation photos. Honestly. Although the author has made every effort to ensure that the information in this itinerary was correct at the time of publishing, the author does not assume and hereby disclaim any liability to any party for any loss, damage, or disruption caused by errors or omissions, whether such errors or omissions result from negligence, accident, or any other cause. The authors, publishers, and contributors to this itinerary, either directly or indirectly, disclaim any liability for injuries, accidents, and damages, whatsoever that may occur to those using this guide. You are responsible for your health and safety for all aspects of this itinerary. Be safe and use good judgment. By providing links to other sites, Simply Awesome Trips does not guarantee, approve, or endorse the information or products available on these sites.